These boards are all available for immediate delivery, but if you don't mind the wait and want a made-to-order board then check out the gallery for possible ideas then email me for a quote. Although the store features ready to order boards that can be bought and shipped to arrive at your door within days, you can also request a custom design to your dimensions and tastes. Only sustainable or reclaimed woods are used in each board. Wooden boards can be maintained using environmentally friendly ways. 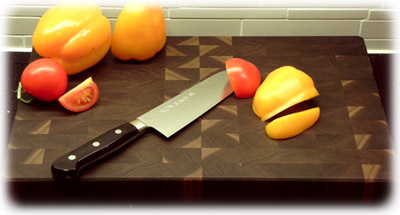 End grain hard wood cutting boards are renowned by world class chefs for their gentle cutting surface. All the boards are designed and made in my workshop in Ontario, Canada. Each board is handcrafted and constructed to make the best use of a given wood's unique qualities and characteristics. No two boards are alike.